Rhino in the Room by Jill Hedgecock (2018, Goshawk Press, paperback, 307 pages, $11.99) is part safari guide and a part eye-opener about the illegal hunting, or poaching, of endangered rhinos. Most of all it’s a coming of age story. Hedgecock’s debut novel introduces 17-year-old Claire who has just discovered a stunning secret between her parents. Then she innocently walks in on Dad with a woman who is not her mother, and Claire’s world is forever shattered. Claire’s apologetic father hopes to heal his relationship with his daughter by taking her on an African safari. Claire reluctantly agrees to accompany Dad despite her anger at him. She also fears contracting malaria in Africa after witnessing her best friend’s chronic illness from the disease. Claire doubles up on her dosage of the anti-malaria drug Malarone, believing it will provide added protection, but it only causes nearly debilitating side effects. Claire finds she cannot hide the disgust and resentment she feels towards her unfaithful father, causing the others in their safari group to feel uncomfortable. Junior, the young, well-muscled guide, “like a Disney movie prince” is assigned to Dad and Claire in an attempt to stop them from their bickering. Junior brings out Claire’s charming side as she checks out his cerulean blue eyes, blond hair and that Australian-sounding accent. The admiration is reciprocated, sparking a new type of tension for Claire. Despite her father’s insistence that she pursue the sciences, Claire dreams of being a fashion designer. She begins to fully appreciate the safari only after she finds wonder and inspiration all around her in the wildlife colors and patterns of Africa. On the sly, she captures them in her sketchbook while her father is distracted taking photos of birds. After a grisly and disturbing discovery in the bush, the guides decide to surprise the tourists by treating them to a once-in-a-lifetime sight: a pregnant black rhino and its mate, possibly the last of their kind. On the way, Claire smells smoke. Poachers, intent on killing the rhinos and harvesting their horns, have set fires coordinated to drive the animals into an ambush. The poachers shoot at the unwitting tourists, and the terrified and Malarone-addled Claire forgets the safari golden rule: Don’t run. Claire and her father battle fire, poachers and wild animals in escalating life-or-death situations requiring decision-making by a young woman who is in way over her head. The suspenseful climax leads to the healing of emotional scars and a new future for Claire. A regular contributor to The Diablo Gazette, the Bay Area’s Jill Hedgecock is a writer to watch. She is passionate about dogs, wildlife, and rhino preservation. Her award-winning essays and publications are often based on her travels. 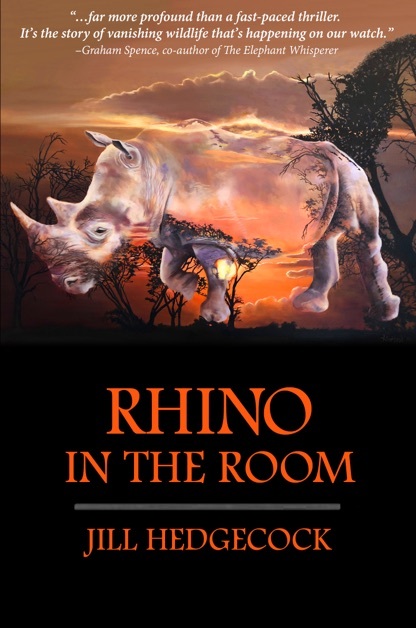 Jill uses this novel, inspired by her own African safari, to raise awareness about the very real threat to rhinos. Superstitious use of rhino horn as medicine drives the ruthless slaughter of these animals. Jill returns to bookends next month. Contact her at jillhedgecock.com. It’s World Rhino Day. Consider buying the book today! Award-winning and internationally-published author Jill Hedgecock is dedicated to taking readers on high-stakes adventures. Her short stories, personal essays, and nonfiction have appeared in multiple anthologies and magazines. Rhino in the Room is her debut novel. She lives in California with her husband and three adorable dogs. Visit www.jillhedgecock.com to learn more.